The Tour de Champagne has been going on for the past few years in cities like Chicago, Boston and San Francisco, and will finally debut at la.venue in Manhattan on November 12, 2009. The Tour will feature tastes from over 20 champagne houses and bites from some of the City’s best restaurants as well as a silent auction benefiting Action Against Hunger - the folks that brought us Le Fooding! Special partners for this evening include Roche Bobois, Riedel Crystal, Relais & Châteaux, Bubble Lounge, Air France and Sherry-Lehmann. The evening concludes with a special “Fin de Soirée” après party at the Bubble Lounge. 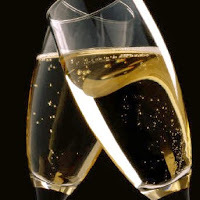 6:00pm to 7:00pm - “Prestige Champagne Seminar” which will include a champagne seminar and tasting of vintage selections from Moët & Chandon, Veuve Clicquot, Ruinart, Dom Perignon and Krug houses. This extraordinary experience is not to be missed and will sell out quickly with only limited seating available! VIP tickets include entrance to Tour de Champagne as well as access to the VIP Lounge throughout the evening. All-inclusive tickets include: tasting of fine champagne, samples from fine New York restaurants and specialty food purveyors, entertainment, silent auction and Air France ticket raffle.